Purchase EBook - "Flies For Connecticut Atlantic Salmon - How to Tie and Fish Them"
Tonight was another quick trip. We're rapidly losing daylight and it was a little too quick for my tastes, but that's the time I had. In order to fish, I had to drop junior off at mom's job in West Hartford, then drive (just ahead of rush hour traffic) all the way to the river. I figure I had about 2 hours and 15 minutes of actual fishing time before dark. I decided to fish a pair of pool which, even in low water, are well suited for two handed casting. However, the water was so low, I wished I had brought the single hander instead. I didn't have time to swap, so I used the 11' 6wt switch rod with mostly overhead casts. It didn't take me long to notice the top guide was loosening up. I have two bent snake guides on the uppermost portion of the rod, as well. I can live with the bent guides, but the tip needs to be fixed. Ugh...like I said, I didn't have much time, so I fished it anyway and it worked well enough to get through the evening. I think its season is over though. If we don't get any rain, it won't really matter. I'm going back to the 9' 7wt rod until it makes sense not to. Pool #1...Water temp 62ºF and the water is getting uncomfortably low. One pass with a #10 Sugerman Shrimp produced nothing. Another pass with a #8 Green Machine w/white tail brought a tiny salmon to hand. I would say the fish was 16" tops. A couple more passes yielded nothing, so it was time to hurry to the next spot. Pool #2...The low water is a little less of an issue here. 1st pass raised a salmon on a #8 Shady Lady. Two casts (and minor presentation adjustments) later and the fish was on. It ran at me faster than I could strip and I lost contact with the fish, thereby losing it altogether. Next pass...While fishing the fast water, I had strong pull on a #10 Sugerman Shrimp, but no hookup. No worries, another couple of casts and it was on. The salmon bolted downstream, jumping a few times along the way. I slowly made my way after it (this pool can be a pretty tricky wade). The salmon made a left turn directly behind a large boulder. Luck was on my side the last two times this happened to me, but it wasn't with me tonight. The fish sawed off my leader at the lowest blood knot. The only other action I had was a tiny smallmouth bass on the blue Bug. 1 for 3 in a little over two hours isn't bad but, considering the diminutive size of the salmon I landed, losing a pair of decent fish and the upcoming rod repair expense, I left feeling a little unsatisfied. I guess I'm happy that I'm finally having luck with Buck Bugs on CT salmon. I've tried them for years here with nothing to show for it until now. They've worked well for me on the Miramichi, Renous and Cains Rivers. It's about time they work here! Congrats on the successful results with the Buck Bugs! That's got to be a sight to see an Atlantic hit your fly on the surface. I'm assuming as the days get colder, that surface strikes will be rare to none. Thanks, Bill. They look like small Bombers, but they're (most often) swung like any other wet fly. I suppose they ride a little higher, but the deer hair is loosely packed, so they're not all that naturally buoyant. I did see the salmon grab them from just under the surface though, which is always fun. Yeah, the dry fly thing is usually best early on. That said, the first Naugy dry fly action I ever had was on the third day of a three day hot streak in mid-November a few years back. It got into the mid-to-upper 70s all three days. So I guess it's not impossible...you just have to get lucky. At this point, I'd rather have rain and high water though! Totally understandable! Some people grease them and fish them dry but I have never tried it with a bug. This blog features some of my favorite Atlantic salmon flies and the occasional trout or saltwater fly. From time to time, I will feature flies from some of my favorite fly tyers, as well as product reviews, fishing reports, and interviews. I hope you enjoy it. Please feel free to contact me with any questions or comments you might have. 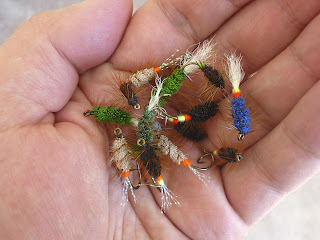 "Flies For Connecticut Atlantic Salmon - How to Tie and Fish Them"